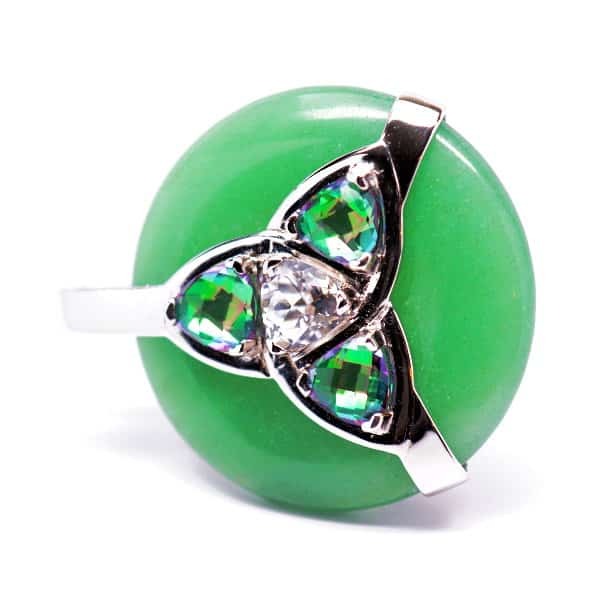 An adventure in green goodness, this beautiful Quantum Stone is ideal for those seeking to improve their luck, success, or attract wealth and love. 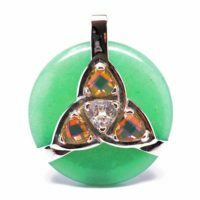 The primary stones in this Celtic inspired piece are a green aventurine torus and 3 authentic green mystic quartz crystals, which promote the manifestation of wealth, romance, fortune. 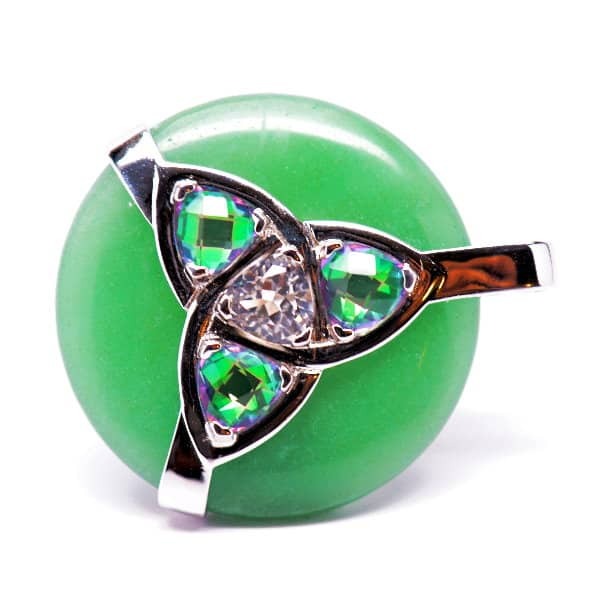 The master stone, clear quartz, centers the torus and completes the filling of the Triquetra design. 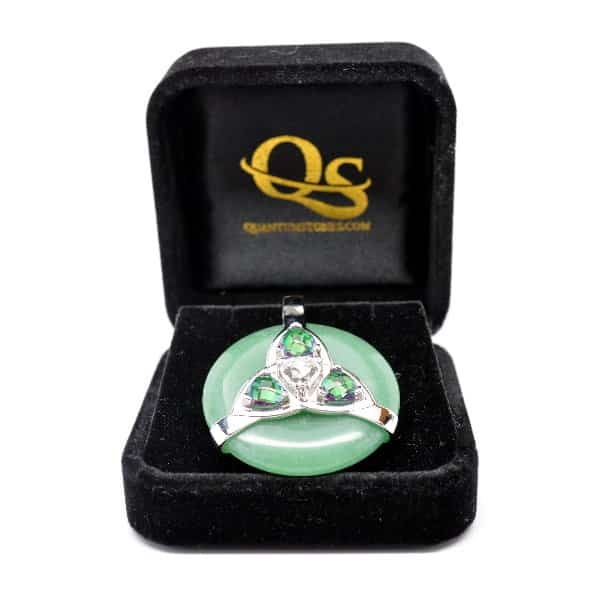 Both mystic green and clear quartz crystals are easy to program to any intention you desire to promote on your mind/body/spirit journey, allowing this Green Aventurine Triquetra Amulet to know no boundaries! 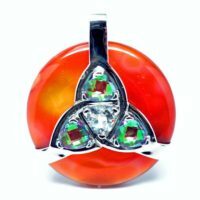 Also known as the Trinity Knot, the meaning of the Triquetra varies among religions and cultures around the globe; however, it’s up to you to purport the meaning of yours…Traditionally, this symbol represents three special or related concepts, sacred entities, or some facet of the three fold essence of our existence or the natural world. 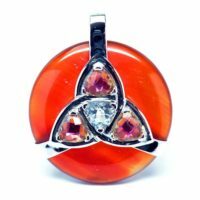 We’ve ramped up the vibrational energy of this healing pendant line with our 3 most popular harmonic infusions and have also included healing magnets behind the center stone. 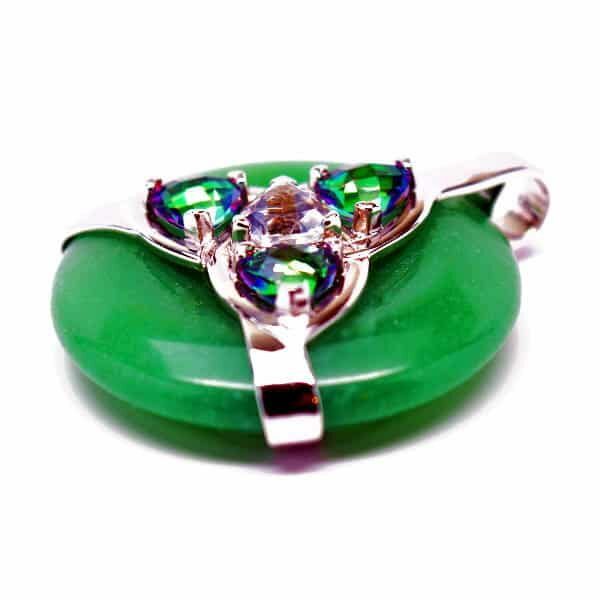 Let’s not forget to mention that the trinity dynamic is represented with another lovely design on the reverse side – they are reversible, meaning you get two fantastic looks in one powerful Quantum Stone! 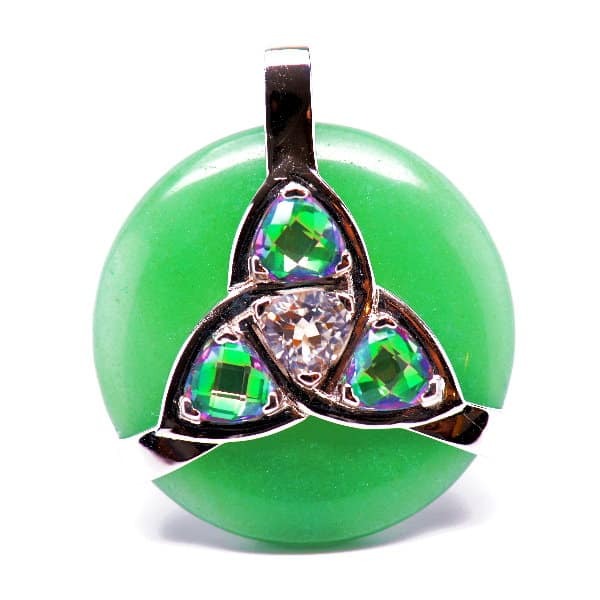 The captivating Triquetra Amulet is the pinnacle of our Celtic Pendant Series. 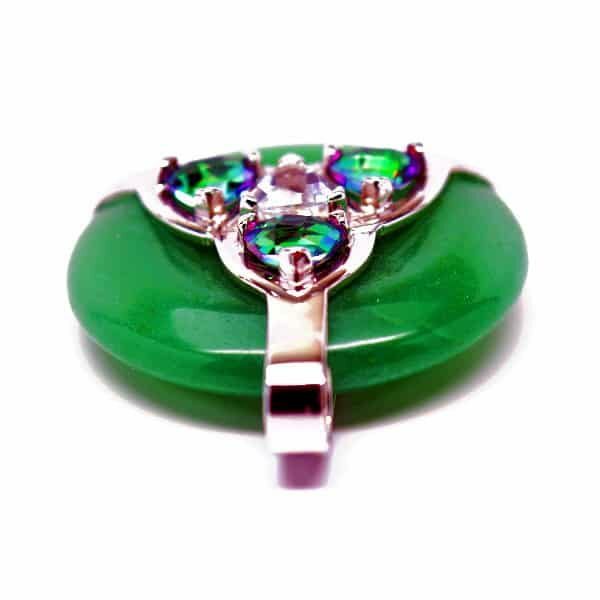 These unique Quantum Stones feature FOUR authentic 8MM trillion-cut faceted crystals to amplify the natural healing properties each LightShield™ infused pendant. We can upgrade your amulet with up to 3 additional frequencies from our collection of patented harmonic infusions, so you can customize your stone to meet the specific needs of your personal Mind/Body/Spirit journey. Included with every pendant is your choice of a free stainless steel chain OR leather cord (22, 24, or 26 in.) a stylish gift box, and a polishing cloth for safe cleaning of your healing stones. 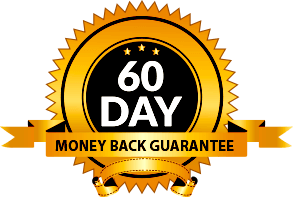 ****Please Note: Consult a physician prior to using our magnet enhanced jewelry if you wear a pacemaker or any device that is affected by magnetic fields. 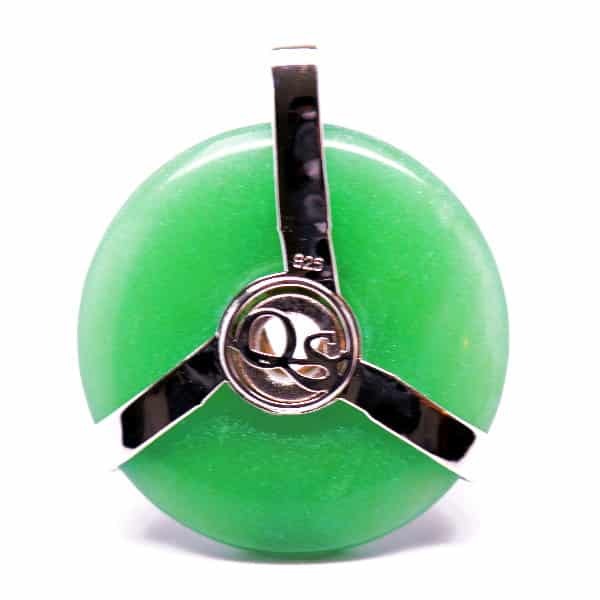 Be the first to review “Triquetra Green Aventurine w/Mystic Green & Clear Quartz Amulet” Click here to cancel reply.